Gekijō-ban Poketto Monsutā Kimi ni kimeta! Pokémon the Movie: I Choose You! [a] is a 2017 Japanese animated adventure film and the 20th film in the Pokémon anime series created by Satoshi Tajiri and produced by OLM. Loosely adapted from the anime's pilot episode of the same name, it was directed by Kunihiko Yuyama and written by Shoji Yonemura. The film stars the voices of Rica Matsumoto, Ikue Ōtani, Unshō Ishizuka, Megumi Hayashibara, Shin-ichiro Miki, Inuko Inuyama, Kanata Hongō, Shiori Sato, and Ryōta Ōsaka. Set in an alternate timeline, the film follows the journey of Pokémon Trainer Ash Ketchum and his friends, Pikachu, Verity, and Sorrel, as they seek to meet the Legendary Pokémon Ho-Oh at the summit of Mount Tensei. I Choose You! premiered at Japan Expo in France on July 6, 2017 and was then released in Japan on July 15. The release coincided with the 20th anniversary of the anime series. The film grossed $37.6 million worldwide and ￥3.31 billion in Japan, and received mixed reviews from critics. Ash Ketchum wakes up late one morning after having broken his alarm clock in his sleep. He eventually makes it to Professor Oak's lab, but is told that the three starter Pokémon (Bulbasaur, Squirtle, and Charmander) have already been taken by Trainers who were on time. However, Oak reveals that he has one more Pokémon, an Electric-type named Pikachu. Despite its volatile and feisty personality, as well as its refusal to get inside a Poké Ball, Ash happily takes Pikachu for his journey. Outside of Pallet Town, Ash encounters a Pidgey. When Pikachu refuses to fight it, Ash tosses a rock at it, but it hits a Spearow that mistakes Pikachu as the culprit. Soon, more Spearow show up forcing Ash and Pikachu to run. Injured and tired, Ash tells Pikachu to get inside its Ball, but it once again refuses. Instead, Pikachu defends Ash from the Spearow by summoning a large Thunderbolt that scares them away. As the storm ceases, a Ho-Oh flies above and drops a feather called a Rainbow Wing. Ash and Pikachu decide to go and find the Legendary Pokémon. After hearing the Legendary Pokémon Entei is nearby, Ash and several other Trainers rush into the woods to look for it. Ash finds the Entei, but ends up fighting over it with a Trainer named Verity and an aspiring young Pokémon Professor named Sorrel. When Entei escapes, Ash and Verity get into an argument and Sorrel leaves, telling them that they need to find shelter soon. As they look to find shelter, Ash and Verity find a Charmander, which they quickly learn belongs to a ruthless trainer named Cross who left it out in the rain. Cross refuses to take Charmander back, calling it weak, and Ash and Verity are forced to find it shelter. They come across a cave where Sorrel happens to be and help Charmander back to health. Sorrel reveals that Ho-Oh only gives the Rainbow Wing to the "rainbow hero" who is destined to fight it, as a shadow Pokémon named Marshadow watches. The next morning, Ash convinces Charmander to join them. The group follows the Rainbow Ring, which guides them towards the Raizen Mountain Range, to meet Ho-Oh. Charmander evolves into Charmeleon. Cross returns and challenges Ash's Charmeleon with his Incineroar. Charmeleon is savagely defeated, causing Ash much grief. Upset over his loss, Ash openly admits that he could have won with Pikachu and later states that he wished he had gotten Bulbasaur or Squirtle. Alone in the woods, Marshadow puts Ash in a sleep-like state as the Rainbow Wing turns dark. Ash has a dream where no Pokémon exist and he attends regular school with Verity and Sorrel. Realizing something is missing, he remembers Pikachu and wakes up to his friends, and the Wing regains its color. The group realize they are getting close when the Wing begins to glow in the direction of Mount Tensei. On the summit, the group makes it to a crystal-like structure called Rainbow Rock, but are interrupted by Cross who wants to fight Ho-Oh himself (he too saw Ho-Oh, but it did not give him the Wing). Cross' Incineroar fights Ash's Charmeleon which quickly evolves into Charizard and defeats Incineroar. Cross, refusing to accept his loss, grabs the Wing and places it on the crystal, but it turns dark, causing Marshadow, an agent of Ho-Oh's, to turn the local Pokémon evil and attack Ash and his friends. The Trainers fight back, but are overwhelmed by the severity of the situation. Ash finally withdraws a severely weakened Pikachu into its Poké Ball as the Pokémon destroy Ash, turning him into pure energy as Marshadow notices the Wing has disintegrated. Ash finds himself in a grey world, but is brought back. Ash takes the newly formed Rainbow Wing and places it on the crystal structure. Ho-Oh arrives and Ash challenges it with Pikachu to battle, but the outcome is never shown. Cross leaves on good terms with the group and eventually Verity and Sorrel leave Ash to achieve their own dreams. The film was officially revealed during the December 15 broadcast of TV Tokyo's Oha Suta program, revealing a teaser trailer and poster of the film. This early content revealed Ash and Pikachu alongside the Legendary Pokémon Ho-Oh, showing that the film would act as a retelling of the first season, exploring some of the important plot points of the series. Ho-Oh's appearance in the film was also detailed to be important to the film's storyline. A second trailer for the film was revealed at the March 1 broadcast of Oha Suta, revealing remade scenes from the first episode and its official English title. It was then posted on the official YouTube page the next day. Later on, the film's second official trailer, which also featured a new version of the original Japanese opening theme, "Mesaze Pokémon Master", was previewed on April 7, 2017. The next day, the producers announced that the current last Pokémon in the Pokédex, Marshadow, would debut in the film alongside several other brand-new characters. As the film is not a direct remake, it diverts itself from the original season that it is based on, and features an original story. Two days before the film's release, Yoshitoshi Shinomiya, who draw background art for Kara no Kyoukai: Mirai Fukuin and Fate/stay night: Unlimited Blade Works released a new poster for the film. With the film confirmed to be initially released at the French Japan Expo 2017, Western fans requested for the film to be released in theaters in the United States. This was eventually confirmed to be released by Fathom Events as a limited release across November 4 and 5, 2017. In Australia, the film was also confirmed to be released by Event Cinemas across November 11 and 12, 2017. Some fans also requested that voice actress Veronica Taylor should reprise her role as the English voice of Ash Ketchum for the film, but it was later confirmed that the current set of voice actors would stay on. The title of the film is also a reference to the first episode of the anime, "Pokémon, I Choose You!". Regular series composer Shinji Miyazaki wrote the film's score for its original release. The film's opening song is titled Aim to Be a Pokémon Master -20th Anniversary- (めざせポケモンマスター -20th Anniversary-, Mezase Pokemon Master -20th Anniversary-) by Rica Matsumoto while the ending is titled Oración's Theme ~Let's Walk Together~ (オラシオンのテーマ　～共ともに歩あるこう～, Orashion no Tēma ~Tomoni Arukou~) by Asuca Hayashi. Veteran composer Ed Goldfarb, along with frequent collaborators Akhil Gopal and Kc Daugirdas, composed a new background score for the film's international release in his fourth film soundtrack to the Pokémon series. I Choose You! premiered at Japan Expo in France on July 6, 2017, and officially released in Japanese theaters on July 15, 2017. Advanced pre-orders the movie tickets across limited time periods (from September 19 to October 30, 2017) allowed moviegoers to receive a serial code to obtain one of the six special Pikachu in Pokémon Sun and Moon, each wearing one of Ash's signature hats from each anime season. These Pikachu were holding an exclusive Pikashunium Z-Crystal. Also, both Marshadow and Ho-Oh were distributed during the film's release in Japan. Merchandise coinciding with the film were also released. Bandai released official Poké Ball Breath Mint Cases in both regular and Premium-Bandai versions to coincide with the film's release. The first set was released in August 2017, and the second was released in September 2017, with pre-orders starting on April 23, 2017. Bandai also released S.H.Figuarts figures of Ash and the Team Rocket trio in July 2017, while Good Smile Company also announced they would release a Nendoroid of Ash in December 2017. The Pokémon Company International and Fathom Events released the film, including its English version, on a limited theatrical run outside of Japan on November 5, 2017, and this was followed by television airings on Disney XD in the United States on November 25, on CITV in the United Kingdom on December 8, and on 9Go! in Australia on December 10. For the film's worldwide release, The Pokémon Company announced special commemorative Pikachu Plush and Pokémon Trading Card Game Cards obtainable in US and Canadian retail sites. The film topped Japanese box office records, earning first place and grossing more than ¥516 million ($4.61 million) in the first two days, beating Gintama on its premiere. The movie earned ¥2.14 billion ($19.6 million) in its fourth week and remained at the sixth position. In its fifth week it grossed US$22 million and climbed up to the fourth position before being dethroned by Transformers: The Last Knight. The film has grossed $30,024,522 in Japan, $3,559,886 in South Korea, $2,401,722 in the United States and Canada, $364,906 in Italy and Mexico, and $1,201,371 in other territories, for a worldwide total of $37,552,407. Some long-time fans of the anime expressed negative criticism over the film on social media due to the exclusion of Misty and Brock in favor of two new companions, with one saying "It's almost like Brock and Misty never existed". Also, criticism was made at the point where Pikachu actually speaks the human language. As shown at the film's first screening at the 2017 Japan Expo, most of the main characters from the first six series were relegated to cameos, which also caused some harsh criticism from older fans. The film received a mixed reception. The review aggregator website Rotten Tomatoes assigned the film a 43% approval rating based on 7 reviews, with an average rating of 5.7/10. Callum May of Anime News Network called the film a "Pokémon movie for classic Pokémon fans" and "While it features new Pokémon from Sun and Moon like Lycanroc and Incineroar, many of the stories and references are from the series 20 years ago, repurposed into far more emotionally moving encounters". It was also praised for having a stronger narrative than the other movies in the franchise, but often criticized on Sorrel and Verity's personalities, calling them "more like bystanders of someone else's story, and the attempts at creating backstories for them aren't built up at all". According to Oricon, the top-selling animation in Japan on Blu-ray/DVD by series sales surveyed from December 11, 2017 to June 10, 2018 ranks Pokemon The Movie: I Choose You! as the 29th most-sold anime series with 24,976 units. 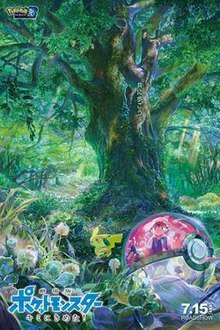 A second film in the alternate continuity, titled Pokémon the Movie: The Power of Us, was animated by OLM and Wit Studio, and was released in theaters in Japan on July 13, 2018. ^ "「ポケモン映画20周年記念ビジュアル」が解禁！ | アニメイトタイムズ". Animate Times (in Japanese). animateLAB. Retrieved August 21, 2017. ^ a b c "Pokémon the Movie 20: I Choose You!". www.boxofficemojo.com. Retrieved April 23, 2018. ^ "World Premiere: The 20th Pokémon Movie". Japan Expo. SEFA Event. May 24, 2017. Retrieved August 21, 2017. ^ "20作目は何かが違う……!? 『劇場版ポケットモンスター キミにきめた！』2017年7月15日公開決定、トレーラーが公開". Famitsu (in Japanese). Gzbrain. December 15, 2016. Retrieved August 21, 2017. ^ "New Pokémon I Choose You! Film Announced (Updated)". Anime News Network. December 14, 2016. Retrieved August 21, 2017. ^ "劇場版ポケモン新作タイトルは「キミにきめた！」、ポスターにホウオウの姿". Natalie (in Japanese). Natasha, Inc. December 15, 2016. Retrieved August 22, 2017. ^ Frank, Allegra (March 1, 2017). "Pokémon's next movie takes Ash back to the beginning". Polygon. ^ Baseel, Casey (March 2, 2017). "Here's the first trailer for the Pokémon reboot/remake anime movie【Video】". SoraNews24. Retrieved August 22, 2017. ^ "Pokémon I Choose You! Anime Film's 2nd Trailer Reveals Guest Cast, New Mythical Pokémon". Anime News Network. April 8, 2017. Retrieved August 22, 2017. ^ Frank, Allegra (April 10, 2017). "Pokémon's next movie revisits the show's first season before shaking everything up". Polygon. ^ Yoshitoshi, Shinomiya (July 13, 2017). "映画『劇場版ポケットモンスター キミにきめた！』（7月15日公開）「ポケモン映画20周年記念ビジュアル」の情報が解禁されました。". Shinomiya Yoshitoshi (in Japanese). Retrieved August 22, 2017. ^ Hoffer, Christian (May 14, 2017). "Fans Clamor for Veronica Taylor to Return as Ash Ketchum for New Pokemon Movie". WWG. Pop Culture Media. Retrieved August 22, 2017. ^ Chapman, Paul (July 3, 2017). "Pokémon Reprises "The Rise of Darkrai" Song for 20th Summer Movie". Crunchyroll. Retrieved August 22, 2017. ^ Goldfarb, Ed [@edgoldfarbmusic] (September 2, 2017). "For 20 years of Pokémon, Ash and Pikachu's origin story is in theaters 11/5 & 11/6. Excited to be part of it" (Tweet). Retrieved September 8, 2017 – via Twitter. ^ Casey (March 15, 2017). "A Special Hat-Wearing Ash Pikachu Is Headed To Japan For Pokémon Sun & Moon". Siliconera. Curse. Retrieved August 22, 2017. ^ Baseel, Casey (April 20, 2017). "Poké Ball breath mint holder series will keep you from being a smelly Pokémon otaku". SoraNews24. Retrieved August 22, 2017. ^ "Become a Pokémon Master with Bandai's Poké Ball Collection!". Tokyo Otaku Mode. April 21, 2017. Retrieved August 22, 2017. ^ Dennison, Kara (April 23, 2017). "Premium Bandai Now Offering Real* Pokéballs". Crunchyroll. Retrieved August 22, 2017. ^ "S.H.Figuarts Brings Ash and Team Rocket Together Again!". Tokyo Otaku Mode. March 2, 2017. Retrieved August 22, 2017. ^ Kahotan (July 12, 2017). "Nendoroid Ash & Pikachu (Pokémon)". Kahotan's Blog. Retrieved August 22, 2017. ^ Sounders, Mike (July 13, 2017). "Still not a Pokemon champion Ash Ketchum is now available in Nendoroid form, with a catch". Destructoid. Retrieved August 22, 2017. ^ "Pokémon the Movie: I Choose You!". Fathom Events. Retrieved August 21, 2017. ^ "国内映画ランキング ： 2017年7月18日発表（毎週火曜更新）" (in Japanese). Eiga.com. Retrieved September 9, 2017. ^ "国内映画ランキング ： 2017年8月7日発表（毎週火曜更新）" (in Japanese). Eiga.com. Retrieved September 9, 2017. ^ "Gekijouban Poketto monsutâ: Kimi ni kimeta! (2017) - International". The Numbers. Retrieved February 13, 2019. ^ Hoffer, Christian (July 10, 2017). "New Pokemon Movie Just Erased Two Key Characters from Ash's Past". WWG. Pop Culture Media. Retrieved August 22, 2017. ^ Ashcraft, Brian (July 10, 2017). "New Pokémon Movie Rewrites History, Ditches Brock And Misty". Kotaku. Retrieved August 22, 2017. ^ Farokhmanesh, Megan (November 14, 2017). "Pikachu is talking now and it's very upsetting". The Verge. Vox Media. Retrieved November 26, 2017. ^ Plagge, Kallie (November 7, 2017). "Pokemon The Movie: I Choose You Ruins Pikachu". GameSpot. CBS Interactive. Retrieved November 26, 2017. ^ Hemmings, Hannah Mylrea (July 11, 2017). "Brock and Misty are being written out of Pokémon, and these people's childhoods are ruined". NME. Time Inc. Retrieved August 22, 2017. ^ May, Callum (July 17, 2017). "Pokémon the Movie: I Choose You!". Anime News Network. Retrieved August 22, 2017. ^ "Attack on Titan's Wit Studio Animates 2018 Pokémon Film With OLM". Anime News Network. December 10, 2017. Retrieved December 12, 2017. ^ Green, Scott (December 11, 2017). "Ash Gets A New Look As Wit Studio And OLM Team Up On 2018's "Pokémon" Anime Movie". Crunchyroll. Retrieved December 12, 2017.